(Quick Effect): You can reveal this card in your hand, then target 1 “Trickstar” monster you control, except “Trickstar Lycoris”; Special Summon this card, and if you do, return that monster to the hand. Each time a card(s) is added to your opponent’s hand, inflict 200 damage to them for each. Trickstar Lycoris is the main burn card that Trickstars rely on. Pop a Trickstar back to the hand to Special Summon her, great quick effect to have. Her quick effect is also great at saving one of your Trickstar monsters during your opponents turn, if you would want to do that. The standard play is Candina to the field, get her search, then pull her back for Lycoris. Lycoris burn triggers Light Stage and that will add up over time. 200LP for Light Stage, then 200LP per card for Lycoris can total up some major damage. Opening turn Reincarnation, Light Stage, and Lycoris (another standard setup) totals 1400LP, that’s 1/8 of their LP gone and their turn just began. She’s a better burner than Candina because she doesn’t have a specific requirement for the burn (spell/trap for Candina). Trickstar Lycoris is a Level 3 Light Fairy-type monster with 1600 Atk and 1200 Def. She continues our Trickstar week with great stats for a Level 3 and an even better effect. She is you Candina searches for because you can reveal Lycoris from your hand and target Candina to Special Summon Lycoris and bounce Candina (or whatever targeted Trickstar on the field) back to the hand. This is a Quick Effect, so you can save Trickstars that are targeted or about to be destroyed and maintain field presence. Her burn effect is also very useful. Every time the opponent adds a card to their hand, they take 200 Damage for each. Multiple Lycoris and Light Stage make this worth a lot of burn damage. Potentially, the right set up can make them lose 2000+ damage just for drawing a single card. It’s worth noting that the cards can be added from anywhere, so a grave recursion also counts for more burn. Lycoris is good in the hand or on the field and even has her own protection in a way. Searchable and awesome means run all 3 forever. The next Trickstar monster is their best one that isn’t Candina, Trickstar Lycoris. Trickstar Lycoris is a Level 3 LIGHT Fairy with 1600 ATK and 1200 DEF. Good stats on a Level 3 and the attribute and type are very good as well. As a Quick Effect, you can reveal this card in your hand and then target a Trickstar monster you control, return it to the hand and Special Summon this card. This isn’t a hard once per turn, so you can get multiple Lycoris out with great ease like this, also you can use multiple Lycoris to target one monster to bounce only one monster and get three Lycoris on the field, so that’s nice. Each time a card(s) is added to your opponent’s hand, inflict 200 damage to them for each card added. More burn, and it’s easier to get off as well. This includes your opponent drawing for their draw phase, so that’s some damage to start their turn, and it adds up the more cards are added to their hand. 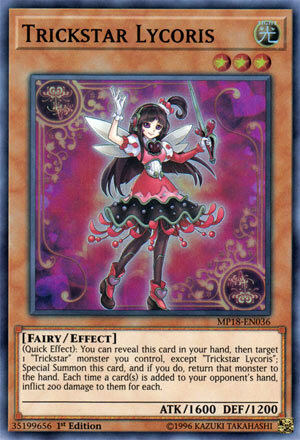 Lycoris is a must for the Trickstar deck because she has the easiest burn effect and she is easy to get on the field to bounce a Candina to use again on your next turn. Art: 4.75/5 I like the red she is wearing and she’s cuter than Candina. Lycoris is the next Trickstar up for review. She’s a Light, Fairy, this time Level 3, who has an impressive 1600 attack (remember, that’s good for Level 3) and a more solid defense at 1200 (than we saw yesterday). So we see a Quick effect, which is a bounce effect here first on Lycoris. By revealing herself in your Hand, and targeting another Trickstar (not her) on the Field, she bounces the other Trickstar to Special Summon herself. You also note a burn effect here, but unlike yesterday, I’m more sold on this one. Each time your opponent adds a card to their Hand, you inflict 200 Damage to them for each card. So many Decks, literally about any Deck worth playing, has countless ways to add cards to the Hand. Just the Normal Draw Phase is 200 Damage, but all the cycling, the ways and possibilities to get the Burn here are more common than yesterday. This could add up fast depending on how aggressive your opponent is. Art: 4.5/5 (again) She looks a bit more dark (not to say evil, but dark) than yesterday, with this black/purple color scheme, but still beautiful.